The Aberdeen Western Peripheral Route (AWPR) is supposed to be the solution for the thousands of motorists who currently have to find a way through the city on a daily basis. But in the the aftermath of the worst of the Beast from the East earlier last month, those living in the Silverburn, Gairn and Moss of Auchlea areas south of Kingsford reported a great deal of water spilling off nearby fields and onto the £745million route. As well as covering parts of the bypass in muddy water, the flooding also resulted in rocks and other detritus from farmland being washed across the road. Transport Scotland say there is still work to be done. One group of residents say that despite previously urging Transport Scotland to re-assess their flood prevention in the area, they have been “completely ignored”, and as a result they now fear the area could turn into a swamp any time there is significant rainfall. One resident from the Silverburn area, a retired engineer, said: “The land around here is turning into the Everglades, the flood prevention that’s being built is just not suitable. “And once the contractor leaves this site, everybody in this area will be affected, because the issue needs to be rectified. “Both before and during the construction of the bypass, myself and other residents living here were consulted on the issue of water flow in the area, but we’ve just been completely ignored again and again. “A few weeks ago after the heavy rain, there was a waterfall of mud and rocks flowing directly from the fields above the bypass down and onto the road itself. Residents have also raised worries about aquifers – natural underground bodies of water – being breached as part of the AWPR works and the impact it has had on farmland in the area. However, Transport Scotland has denied any aquifers have been punctured. 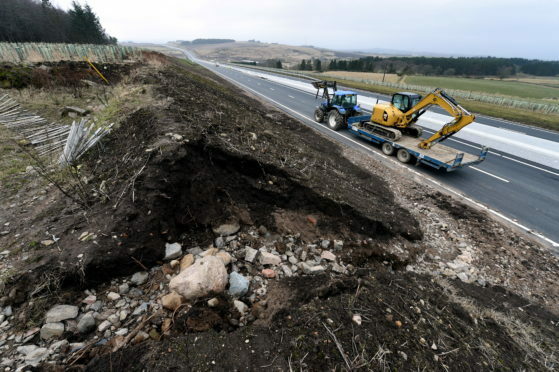 A spokesman for Transport Scotland said: “Aberdeen Roads Limited has confirmed that although groundworks have been undertaken, no aquifers have been punctured as a consequence. “Construction of the water management system is well under way but is not yet complete, as it includes connecting a number of field drains.